Bill Gates believes the humble toilet is overdue for an update. For the past seven years, the Microsoft-CEO-turned-philanthropist has been calling for the development of low-cost, high-efficiency toilets that would bring effective sanitation to the world's most impoverished areas. At a toilet expo in Beijing in November 2018, he held aloft a jar of human waste and told the audience, "We see ourselves on the cusp of a sanitation revolution." But if Gates is bullish on a new toilet for developing nations, other advocates are calling for a do-over of the bowls in bathrooms all around the world. "Everything these days is connected and smart, but I feel like the bathroom is a very untapped area," says Sameer Berry, a Los Angeles-based gastroenterologist-in-training who penned a recent essay on toilet technology. "There's not been much innovation there for hundreds of years." Since the 1980s, Japanese companies have been selling high-tech toilets for home use that pamper users with calming music, heated seats and built-in bidets for cleaning up. More recently, researchers overseeing a European Union-funded project called iToilet have begun testing amenities for elderly and disabled people, including motorized toilets that adjust their position in response to voice commands and depth sensors that can detect if a person has fallen. However, several smart toilets are in the works that would go a step further by offering a window into the health of the people who use them. At least one Japanese firm already makes a smart toilet for use in hospitals; Toto's "Flowsky" toilet looks like an ordinary toilet but is designed to check for abnormalities in urine flow that might signal bladder or prostate problems. Berry envisions smart toilets for use in private residences. His dream is an internet-connected toilet that safeguards health by using discreetly placed sensors and artificial intelligence to analyze waste. Such a toilet could detect early signs of disease and help people manage chronic conditions such as diabetes. "If they were all incorporated into one toilet we'd be able to get so much data from that — I think it would be incredible," says Berry, who will start a gastroenterology fellowship at the University of Michigan in Ann Arbor this year. "The opportunities are honestly endless." Smart toilets could even yield insights into public health, says Michael Lindenmayer, the smart sanitation and digital health co-lead at the Toilet Board Coalition, a consortium of businesses and nonprofits focused on improving sanitation worldwide. The Geneva-based nonprofit is working with the city of Pune in India and the European Space Agency to collect data from smart toilets in public bathrooms, as well as landscape and weather information from satellites. The goal is to give health officials evidence of a disease before it becomes a full-blown disaster, such as the West Africa Ebola epidemic in 2014. "Scientists that we're working with tell us we could have predicted that type of outbreak if we'd been monitoring what goes into our toilets," says Cheryl Hicks, the organization's executive director. There's no doubt that human waste contains lots of clues about our health. Many ailments leave their mark in urine and feces, including diabetes, infections, kidney disease and cancer. The telltale signs of trouble can be detected via cameras, chemical analysis, or other techniques, experts say. And smart toilets have a key advantage over Fitbits and other wearable health and fitness trackers: Users don't need to remember to charge them or put them on. "Unless you're superhuman, you're going to use that toilet," says Sam Gambhir, director of the Canary Center at Stanford for Cancer Early Detection in Palo Alto, California. "There's no way around it. You [will] just use it like you would any other toilet, but it's doing all this monitoring in the background." One of the first smart toilets was available from Toto in the early 2000s. The toilets sampled urinary sugar and hormone levels but were ultimately discontinued due to low demand, Bill Strang, the president of operations and ecommerce for Toto USA, told NBC News MACH in an email. However, "we are constantly monitoring the market for a strong trend in this area," Strang said. In recent years, signs of a growing interest in smart toilets have emerged as people's appetite for health-tracking devices has grown. Google was recently granted a patent for a toilet that would gauge a person's blood pressure as they sit down, along with several other health-tracking bathroom fixtures. In September 2018, electronics giant Panasonic released a health-tracking toilet in China that tests the urine for blood, protein, and other key health indicators. The device also uses sensors embedded in an armrest to measure a person's body fat and identify different users by scanning their fingerprints. Like Berry and Gambhir, Vikram Kashyap, founder and CEO of the San Francisco-based startup Toi Labs, is another who thinks the time has come for smart toilets. His company is currently testing its "TrueLoo" toilet seat in homes around the country and hopes to bring it to market in several years. The toilet seat, which he said can be attached to most existing toilets, uses "optical sensors that scan what's in the toilet," Kashyap says. The goal is to analyze urine and stool for abnormalities in color, consistency, volume and frequency; future models will also chemically analyze the waste material, Kashyap says. Meanwhile, Gambhir and his colleagues are also developing a smart toilet for residential use. The device will replace a conventional toilet seat and flush handle. A number of sensors will be housed on the underside of the seat, including a camera and a cartridge with paper strips that change color when they come into contact with different substances in the urine, such as blood or sugar. When motion sensors detect that a person is sitting down, this cartridge will slide into view and sample urine on its way into the bowl. The experience of using such a toilet won't be intrusive, Gambhir says. People will simply go to the bathroom, flush and go on about their day. Meanwhile, the toilet will analyze the user's waste, identify the person using fingerprint sensors embedded in the flush handle and then send the results to the cloud or an app on a smartphone. And should the toilet detect a worrisome trend — like traces of blood in the urine — it will send an alert prompting the user to schedule a doctor appointment. Gambhir is setting up a clinical trial to test the devices, and ultimately plans to collect a wide range of information, including urinary sugar levels, blood, urine flow, the presence of bacteria and stool consistency. 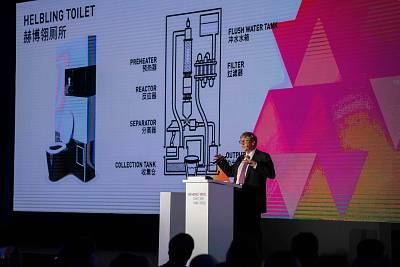 He and his colleagues have not yet decided how to commercialize the smart toilet, but Gambhir said he hopes it will be ready for home use in five to seven years. Smart toilets present a series of challenges for those trying to develop and market them, including making them reliable and easy to use — and finding a way to connect with consumers who might find such a product intrusive. "People — particularly in the U.S. — are very squeamish and skittish about talking about their excreta," Kashyap says. Then there's the matter of privacy. "This is very, very personal data," Berry says. "So this technology is going to have to have very robust security infrastructure to make sure this isn't data that a hacker or a thief or a curious houseguest would be able to make themselves privy to." 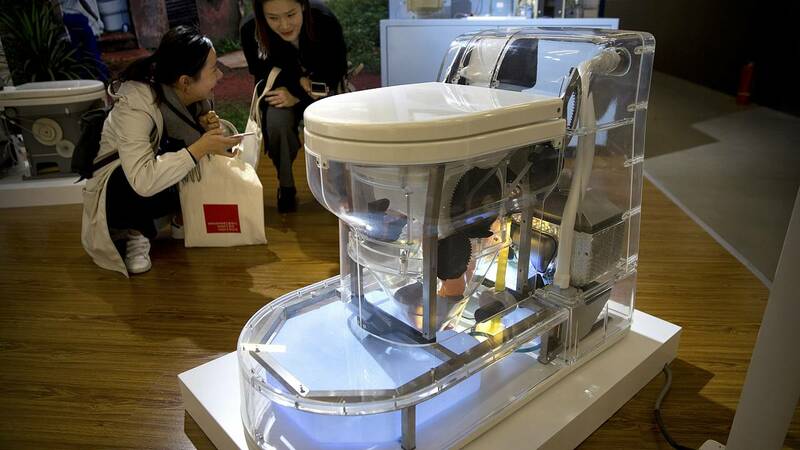 But Lindenmayer thinks consumers will likely embrace smart toilets once they realize the benefits they offer. He says occasional doctor visits offer a comparatively fragmented view of health, likening one's day-to-day health to a motion picture. "It's as if you were to watch a full feature-length film and only have two frames of it," he says. Smart toilets could help fill in the gaps in this picture, Lindenmayer added, giving people more control and awareness of their own health and bodies.